I have this slight obsession with finding a sugar cookie recipe that will come as close as possible to my beloved Pepperidge Farm Sugar Cookies that I by at the grocery store. I love these cookies, I mean seriously they're everything that I want, soft, chewy and positively delicious! I wanted a recipe that would give me those cookies. I found a recipe that absolutely surpasses all my expectations! I'm sorry Pepperidge Farms, I never thought I would say this, but you pale in comparison, yes... it's true. I don't ever have to by another boxed or bagged sugar cookie again, this is the one, the softest, chewiest , melt in your mouth sugar cookie I've ever made. One recipe obsession down....!. HA HA!! 4. Beat in egg, vanilla extract, lemon extract and lemon peel. Yay, for new laptops when old ones bite the dust and leave to laptop heaven! So exactly how many more recipe obsessions do you have Bunny?! Congratulations on your new laptop! I'm so happy for you that you have a husband who understands the computer addiction! I agree sometimes you feel like a nut, I mean a simple recipe, and sometimes you don't! Everything looks tasty! the chicken looks delish. I love the presentation of the popsicles and the sugar cookies sounds fantastic. Congrats on the new laptop!! Loved the bunny pictures, so cute. Everything sounds delicious, delicious chicken, the cookies look as if they will melt in the mouth and the popsicles so refreshing. You are so lucky to have a good man!!! YThe chiciken looks truly delicious & your cookies are a must try!! I also love the Popsiclers,...Yummie all the way!! So glad you were able to get a new laptop Bunny!! I love that chicken. I make it often and it's truly the best! I am also loving the look of those tasty sugar cookies!! GREAT menu!!!!!!!!!!!!! Congrats on your new computer. I think my hubby would say the same thing. I absolutely hear you about not having my computer. Fortunately we have a his and hers and when one is down usually the other one is still (limitedly LOL!!) available for the other to use (as evidenced by Ole Sweetie-Pi's lost look this past week as HIS computer was in for repairs). That chicken looks superb! I've only had it with bottled Italian dressing, no brown sugar, and I think that is the missing ingredient. I am definitely making this; I think I even have the dried Italian salad seasoning in my pantry. You have sold me on the sugar cookies. I will be making these soon. Sugar cookies are Sweetie-Pi's all time favorite cookie, and if you have discovered the best, well those are the ones I want too! Adult popsicles, how positively delightful. We always have popsicles in the freezer here, they are eaten almost every day. What a fun, adult, upscale version. Will certainly have to give these a place in the freezer!! Glad to hear you have a new computer. I know that I am lost without mine! All the food looks terrific but I love those cookies. Not much can top a good sugar cookie! I would love to try them. your hubby's a star--thank him for me, will ya? i couldn't go on without some of the amazing things you post. case in point--those cookies! they're sooo soft-looking! the chicken looks phenomenal too, and "simple" doesn't even begin to describe the method. love it! So glad that you're back up and running! Nothing like a new computer to put the zip back in your do-da! The chicken and cookies look fantastic and I'm going to try them both. Those popsicles! I could definitely use one right now! 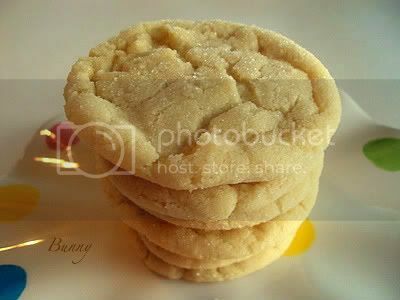 Bunny I really love your soft and chewy sugae cookies, look amazing and delicious. It's only 37 degrees in Montana right now, but I want one of those popsicles! As usual, they all looke great! I will try that chicken...always looking for new recipes. Oh, I can feel your pain. My hubby thinks my battery is toast and I'm having the worst time getting my computer running any time it goes into sleep mode or gets shut down. You'll find me in the fetal position when it finally sputters and dies on me. So glad you got another so you could post this super simple chicken dish. I'd hate to have missed it! Girl! You had me laughing at the bunny pics! And your hubby rocks, I mean just buy the girl a new laptop and all is well in the world--smart man! Cosmo popsicles? I am in heaven with those bad boys. Oh my! I don't know what I'd do w/o my computer. That chicken looks absolutely delicious. Sugar cookies are one of my favorite cookies too. And, oh my, I think I got a buzz reading about the popsicles! I would love one of those popsicles right now. But in liquid form would be just as good. I'm so glad your back! And you brought us such delicious delights. The chicken sounds fantastic! I'd love to have some and follow it up with those scrumptious looking sugar cookies and a popsicle or two! What a great husband you have - what hillarious bunny pics those were - and the chicken - mouthwatering! Sugar cookie chicken popsicles... Oh, my! That 'simply great chicken' is a winner for sure. 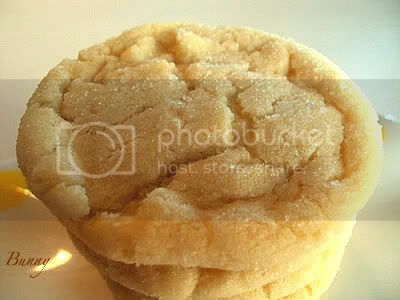 As for your Chewy Sugar Cookies - there was a great old bakery in my hometown of Augusta, GA. As soon as you walked in - one of the ladies who worked there always handed you two of their Sugar Cookies - saying "You have two hands, don’t you!" I'll never forget that wonderful childhood memory. Cosmo Popsicle - my kind of treat! Lucky you- a new laptop! Your bunny pictures told the story perfectly. Nice hubby. Those sugar cookies are luscious looking! Kind of chewy? And the popsicles? Love your photo and I bet they were delicious. Yay for a new laptop!! I SO want one of those Cosmo popsicles, what an awesome idea! Lucky you! What gorgeous popsicles. I love the photo. The chicken looks delicious and sounds so easy and those cookies are beautiful. I must try them. Great post! I'll take a bit of everything especially one of those Cosmo Popsicles! Ooh the cookies look great! Wow everything looks so fabulous!! You are right Bunny, you don't realize how your computer becomes an extension of you being until it's gone. I'm glad you are back! I feel tipsy just looking at your popcicles. My computed died a while ago as well..it was pure hell! Yay for new laptops!! You know, those things don't seem to last long these days I tell ya. Everything, as always, looks amazing. Thanks for stopping by today - yeah, it is HOT. Yaey for a new computer! =) I definitely have to make those sugar cookies. Your gushing about them and the delicious photo convinced me! I could go for one of those popsicles too. Thanks for stopping by! You can adjust the heat on the Kung Pao by the number of Chili's. I pick them out and hubby eats them! I can't even think about my computer dying! It's like an old friend. I took over my hubby's laptop when I started my blog. What did we do before computers? Anyway, as usual you girls temp us with juicy looking chicken, warm and comforting sugar cookies, and spiked popsicles that I will keep in mind for the summer! (way too cold here right now) Thanks for a great morning visual! Living without a computer is definitely not fun! Glad the new laptop saved the day :). The cookies look so tender and delicious, I also like the sweet and savory combo of the chicken! Everything looks and sounds absolutely amazing!!! Keep up the great work, your site content and photos are amazing!! Did you get an APPLE? computer that is.... I love mine. If I ever send in a recipe Bunny, call the paramedics, quick. I would love to make those cosmo popsicles.. I think I can do that. My BFF Julie would LOVE those for sure. We don't have Pepridgefarm cookies here in Ontario, Canada (how ever you spell it) but yours look delish! Those sugar cookies look to die for! oh i love the chicken, everything looks so good! Carol, I just wanted to drop a quick line to let you know I made your Simply Great Chicken for dinner last night, and you are right, it is Simply Great!! What a winner in this household. Of course, I am going to have to make this again and blog it because we need to get the word out to as many people as possible, grins. We will be enjoying this one OFTEN, I can assure you. What a treasure and one for the family archives. I want all our kids to know about this.. It is amazing how dependent we are on technology! Love that juicy looking chicken and ice pops! I would have been unbearable too, can't live with out the compy. Loving the lollies, and those cookies look delicious! OMG OMG your bunny!! cutest thing that made my day! Oh, those cookies look divine! I hate it when that happens. I cant live without a comp too! The chicken looks amazing! Carol, I posted your delicious chicken recipe!!!! Popped over from Katy's blog and yep...she is right...nice blog you have here! I shall link to you in my sidebar so those visiting my site have a good read as well! Great recipes...well done ladies...beautiful! Yesterday I made the chicken recipe which was mm..mmm good and today I made these cookies and they are awesome..they really are soft and chewy and the lemon..well that just took it over the top! That chicken looks devine. And your photo of the adult treats in an adult glass...too creative and cute! You go girl!